Sometime around December 10th, Florida birders started reporting an irruption of Razorbills in both the Atlanta coast and into the Gulf shore regions of the state. The influx of the species is unprecedented and has been quite astir. This cold water species has only had a hand-full of reports into Florida waters. But this year large flocks were reported off shore and a number were being seen around fishing piers and beaches. E-bird Razorbill Report - Provides an excellent description on what has been happening here. Sadly the long trip to these waters sapped the strength of many of the birds, with several dozen ending up in seabird rehab facilities. Most were too far gone to survive, but a few managed to hang on. According to the papers the survivors can not be returned to the wild because of concern by wildlife management officials that there is potential of introducing illnesses or parasites to the healthy populations. Technically they would have to be destroyed if they can not be released. But I sure that some institution would love to have them. My first attempt to spot one locally involve a two mile chase traveling north along the beach at Captiva Island starting from Blind Pass. Bob Pelkey already had spotted and was photographing the bird through the race. But I had arrived about twenty minutes late and never could catch-up. The photo of the razorbill was taken by Bob on this trek. I struck-out as the bird was lost but was able to add a juvenile Northern Gannet, a Common Loon, several Red-breasted Mergansers, plus all the expected shore birds, gulls and terns. One interesting experience was watching a Peregrine Falcon attempt to catch a Royal Tern. It would approached a bird from above and try to drive it into the water. As we watched, the terns would manage to escape. I did succeed shortly before the New Year with great views at the Sanibel Lighthouse fishing pier. Also was able to add Bonaparte's Gull and a Great Black-backed Gull. 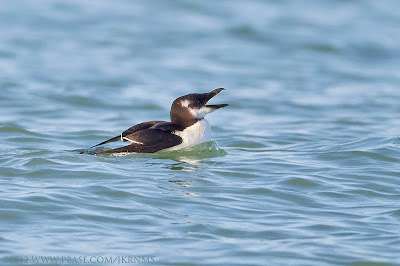 On my way home was able spot a second razorbill hunting along the Sanibel Causeway. But now, in 2013, they are thinning out and becoming more difficult to find. I did manage to see on in flight a week ago at Bunche Beach. You never know what you'll encounter.